Lifestyle maven B. Smith and her husband "Thank You Dan" Gasby on mixing business with marriage. It’s hard not to believe that everything happens for a reason when you listen to the story of how iconic restaurateur, author, and lifestyle maven B. Smith met her husband, veteran TV executive Dan Gasby. A few years later, Gasby bumped into Smith in New York City again, and she dazzled him once more. “You know your life would be a lot better if you made a phone call,” she told him, with a flirty tone. He did, and it was the beginning of a beautiful love story. Today, they’ve been happily married for 20 years and both had much success in their marriage and careers. The New York Times once called Smith “a Renaissance woman,” and Chuck Scarborough deemed her a “domestic goddess,” while Gasby’s outstanding television career includes accolades like creating and producing Big Break, a musical variety show hosted by Natalie Cole, that was the forerunner to reality talent competitions like American Idol and helped launch the careers of R. Kelly and Eric Benet and working as a top sales executive on many of the most successful shows in the history of TV syndication. But perhaps the best business decision they ever made was to work together. Gasby first teamed with his wife in 1996 as creator and producer of B. Smith With Style, a weekly syndicated lifestyle program, and then he served as publisher for B. Smith Style magazine. Today, as Chairman of B. Smith Enterprises, Ltd., Gasby oversees the day-to-day operations for all three B. Smith restaurants. The unstoppable duo’s latest venture is perhaps their most exciting to date. 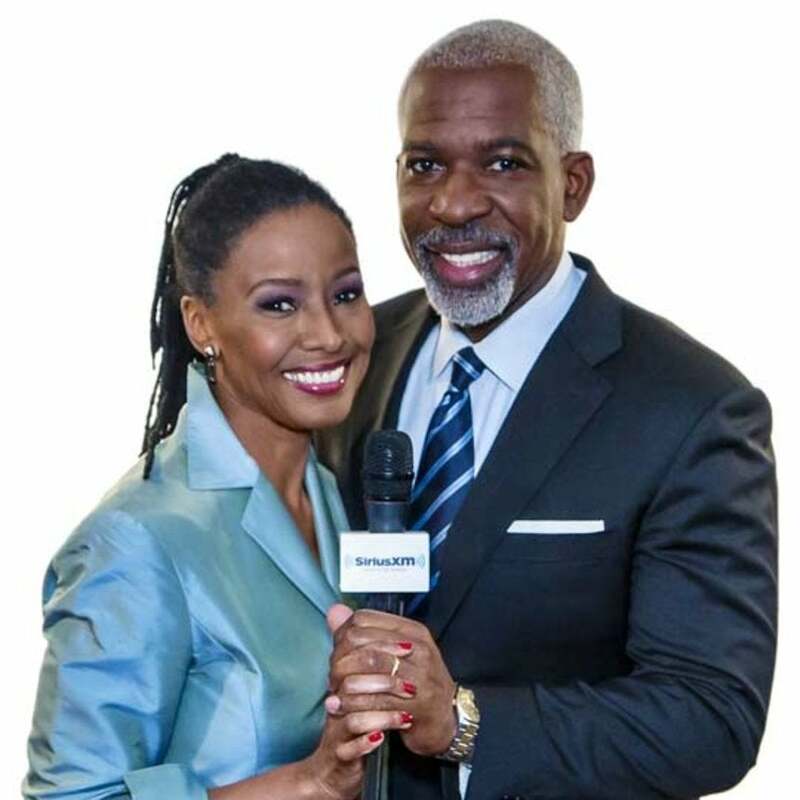 As hosts all-new SiriusXM radio show The B. Smith and “Thank You Dan” Show, they’re sparking insightful conversations daily about healthy living, food, entertaining, succeeding in business, as well as sharing their secrets to a successful relationship. Let’s hear it for Black love! ESSENCE.COM: How do you make it to 20? B. SMITH: Lust and trust, and never going to bed angry. DAN GASBY: Lust without trust will be a bust, and trust without lust will turn to rust. You have to have passion. We talk about it on our show. You have to like who you love, and you have to love who you like. There’s no perfection in marriage. You come with two sets of experiences and you do have ups and downs. The media doesn’t play up the percentage of Black men and women who love each other and are in happy, committed relationships. Fortunately, I think the pendulum is beginning to swing the other way and it has a lot to do with who’s in the White House. ESSENCE.COM: What else works for you? SMITH: In our marriage, we work together, we love together and we live together, so there is a give and take that has to happen. GASBY: We like each other and that goes beyond the love. When you’re married for twenty years, you have the ups and downs, but you have to ask yourself: Is this a friend too? ESSENCE.COM: How do you spend so much time together without driving each other crazy? SMITH: I let him do what he wants to do, and he lets me do what I want to do. There are times we’ll be together and then times we have to have our own space. GASBY: Now that we’re working all the time together, sometimes if we’re at the restaurant she’ll go home early, or if we’re at home, she’ll watch TV and I’ll go to sleep or hangout. Getting away keeps everything fresh. ESSENCE.COM: Can couples ever really mix business and pleasure with ease? SMITH: We knew instantly that the fusion was there. GASBY: Everyone shouldn’t be an entrepreneur and everyone shouldn’t work with his or her husband or wife. You’ll know if it’s for you or not. ESSENCE.COM: What types of things do you still enjoy most about each other? SMITH: We have fun together! GASBY: We laugh together. We cook together. We even roll our own sushi. SMITH: Yes! Rather healthy meals too. When we have fun, we have fun! ESSENCE.COM: If you could speak to young people who don’t believe in love or marriage, what would you say? SMITH: You’re definitely going to miss out in life. In the end, nobody wants to be alone and there will come times that you’ll want to have a family and it will be too late. Think about it, and talk to somebody about it. We need to do more of that as a people. GASBY: The inability to make a commitment to someone is also the inability to grow as a human being. Honestly, to be in control is to not need to control things. You can be a billionaire, but if you’re lucky, you’ll get about 30,000 really good days in your life. It’s better to have loved and lost than to have never loved at all. I want to see Black women with Black men, but most importantly, I want to see them be happy. You only get so many chances to grow…Love is all about the details. ESSENCE.COM: What can we expect from your new radio show? GASBY: I took her first book and sold it as a TV show, and she said at the end of the show, “Thank you Dan!” So, then women started calling me “Thank You Dan,” so we thought it made sense to put it in the show title. SMITH: What we love about it is that we’re able to talk to a lot of people all over. We’re going to be as candid as we possibly can. GASBY: She has a segment called “Flow” for the ladies to call in with questions, and I have one called “If I Had a Son” where I talk to young Black men. SMITH: We address full circle lifestyle. Tune in to The B. Smith and “Thank You Dan” Show daily on SiriusXM’s Urban View station, channel 128 from 3pm-6pm EST.